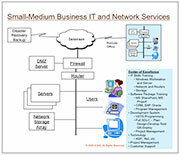 Small-Medium Business IT and Network ServicePackage. Business Strategy and IT Alignment: Work with C-Level management to review business strategy, goals and objectives. The current IT environment is assessed to determine status of operations and performance metrics. A snapshot of the status is then compared with standard industry metrics and like companies. Strengths and weaknesses are determined and a roadmap of corrective actions is identified. Recommended projects are outlined with priority aligned with Business Strategy. IT Solution Design and Implementation: Business network with IT Infrastructure and off-the shelf technologies from our industry partners (Microsoft, Oracle, SAP and others) are designed and customized to meet customer needs. The solutions are implemented by our highly experienced and certified staff with guaranteed results. Our staff is trained in our Center of Excellence (COE) to ensure the highest quality and standards are met. Project Portfolio Management and Project Management Office Setup (PMO): Proven Project Management technologies to manage and control projects and implement standard processes are a key to successful project delivery. G-ESI specializes in setup of PMO and implementing network based project management technologies. Off-the-shelf partner products (Microsoft Project Server, HP Mercury Quality Center) as well as SaaS solutions are offered based on customer needs. Program/Project Management: Our experienced and certified staff is part of the solution delivery services to our clients. Our project governance and oversight includes project management service (PM-SaaS) to allow customer monitoring and reviews. 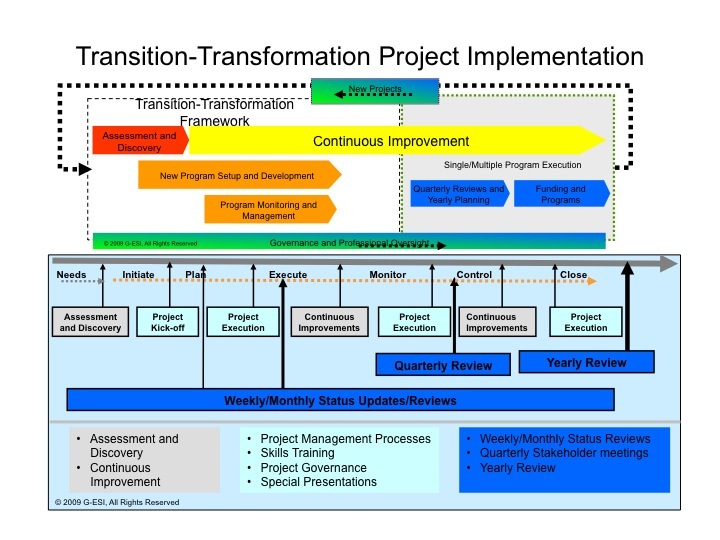 Center Of Excellence based IT Transition-Transformation:G-ESI has a unique model based on center of excellence to ensure the highest quality end-to-end transition and transformation of IT infrastructure and software. To provide the best value and quality, the solution design, development and testing is done in our controlled environment prior to delivery, thus minimizing unnecessary surprises and lowering development costs during deployment. Technology and Skills Training:G-ESI provides IT hands-on training at our training center for knowledge transfer as part of our obligations. We also provide skills training for skill enhancements of customer’s IT staff. Post-Sales Support: All solution delivery and implementation are offered with Gold (8 hour), Silver (12 hours) and Bronze (24 hours) service levels for Post-Sale Support. Our 24X7 call center and skilled staff are available to service toll free (ITIL based L1-L5) and web based service calls. G-ESI differentiates its services by providing a complete portfolio of service offerings to our clients. These services include Business Strategy and IT Alignment, IT Solution Design and Implementation and Post-Sales support. The services are provided at a low cost with a high value often associated with high priced “big five” consulting organizations. G-ESi’s experienced and certified staff combined with a proven delivery methodology are the foundation for our value and solution delivery guaranteed services. G-ESI differentiation is the end-to-end solution offering and implementation services at an SMB cost at a “Big Five” value. Copyright © 2010-2013 Global Enterprise Strategy and Implementation. All rights reserved.